In 2006, Senate Bill 7 amended substantial portions of the workers’ compensation statute. Notably, R.C. 4123.512(D) was amended to require claimants to obtain the employer’s consent before voluntarily dismissing a complaint in a court appeal. The purpose of the amendment was to prevent claimants from delaying an employer’s remedy on appeal. On October 29, 2015, in Ferguson v. State of Ohio, 2015-Ohio-4499, 8th District Court of Appeals held R.C. 4123.512(D) is unconstitutional. Ferguson involved an employer’s appeals of the initial allowance of a 2009 claim and an additional condition, which appeals were consolidated for trial. Shortly before trial, the claimant moved to dismiss his com-plaint without the employer’s consent. He also moved to amend his complaint to include a declaratory judgment action seeking a finding that R.C. 4123.512(D)’s requirement to obtain the employer’s consent before voluntarily dismissing the complaint was unconstitutional. The trial court denied both motions. Six months later, the claimant filed a separate declaratory judgment action on the constitutionality of the statute. The trial court granted the declaratory judgment action, finding R.C. 4123.512(D) violated the separation of powers doctrine, and the equal protection and due process clauses of the federal and Ohio constitutions. The State appealed the trial court’s decision to the court of appeals, which affirmed the trial court in all respects. The court of appeals found R.C. 4123.512(D) violates the separation of powers doctrine because the statute conflicts with Civil Rule 41(A)(1)(a) and usurps the Ohio Supreme Court’s power to regulate the Civil Rules. The court reasoned that when such a conflict arises, the Civil Rules take priority on procedural matters, while a statute controls on substantive matters. The court found that R.C. 4123.512(D) pertains to procedure, and as such, is ineffectual in the face of the absolute right to voluntary dismissal provided by Civ.R. 41(A)(1)(a). The court also found R.C. 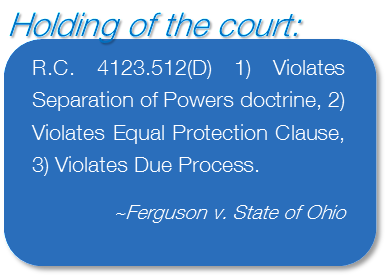 4123.512(D) violated the equal protection clause of the federal and Ohio constitutions because it treated plaintiffs in employer appeals differently than plaintiffs in all other types of litigation. Although the State argued workers’ compensation appeals are special proceedings, which are excepted from the Civil Rules, the court of appeals disagreed. Finally, the court reasoned R.C. 4123.512(D) violated due process because there is no rational basis for stripping workers’ compensation plaintiffs of their dismissal rights in light of the fundamental purpose of the workers’ compensation act to protect injured workers from losses sustained in the workplace. Although the appeal period has not expired, it is likely the State will appeal the court of appeals’ decision. Obviously, the ultimate outcome of this case is important to employers because of the case’s effect on litigation under R.C. 4123.512. Until the Ohio Supreme Court decides this issue, the court of appeals’ decision is controlling only in the 8th District. Nevertheless, this does not mean the decision will not be considered persuasive authority in other appellate districts. Employers should expect claimants to challenge the constitutionality of R.C. 4123.512(D) in other jurisdictions. Employers with pending appeals in the trial courts should consult their attorneys about trial strategies in light of Ferguson. In State ex rel. Salyers v. Buehrer, 2015-Ohio-4507, the 1st District Court of Appeals examined the propriety of presenting medical evidence in support of substantial aggravation and direct causation in a R.C. 4123.512 appeal. In this case, the claimant filed a motion to additionally allow the claim for a disc bulge, a disc herniation, spondylolisthesis and radiculopathy on either a direct causation or substantial aggravation basis. The Commission denied the motion, disallowing all the conditions. The claimant appealed to court and the trial court conducted a bench trial. At the conclusion of trial, the trial court allowed 3 of the 4 conditions. The employer appealed on the ground that the claimant’s medical expert testified the work incident “either directly caused or substantially aggravated” the conditions. The employer argued the opinion was insufficient and unreliable. The Court of Appeals reversed the trial court, noting that substantial aggravation and direct causation require different proof and provide different grounds for recovery. The court found the claimant’s expert opined that it was probable that the claimant’s conditions were caused by the workplace accident, but he was not able to opine that it was probable that the accident was a direct cause of the injury or that it was probable the accident substantially aggravated a preexisting injury. In addition, the court found the record was devoid of any objective evidence to support substantial aggravation, a statutory requirement. Because the expert’s opinion was equivocal, the court reversed the trial court’s decision and entered judgment in favor of the employer. The Salyers decision appears to conflict with the Commission’s Hearing Officer Memo S11, which provides a claim must be construed broadly and evidence supporting both direct causation and substantial aggravation may give rise to a compensable claim. Court of appeals decisions are not controlling on the Industrial Commission. Nevertheless, employers should be mindful of Salyers when arguing claims in which recovery is sought on the grounds of direct causation and substantial aggravation. Employers should know that under R.C. 4123.54(G), the payment of compensation and benefits for substantial aggravation conditions can be terminated upon a finding that the claimant’s condition has returned to its pre-injury status. Until recently, an unresolved question has been: are Commission orders on return to pre-injury status appealable under R.C. 4123.512 or subject to review as mandamus actions? On October 30, 2015, the 1st District Court of Appeals answered this question. In Clendenin v. Girl Scouts of Western Ohio, 2015-Ohio-4506, the claimant had an allowed 2009 claim for “substantial aggravation of preexisting dermatomyositis,” an auto-immune disorder. The Bureau filed a motion to terminate compensation and benefits associated with said condition pursuant to R. C. 4123.54(G), which motion ultimately was granted by the Commission. The claimant appealed to the trial court pursuant to R.C. 4123.512. During the pendency of the appeal, the Bureau moved to dismiss the case on the ground that the claimant’s remedy was the filing of a mandamus action, which addresses “extent of disability” questions. The trial court agreed, dismissing the case. Under the court’s reasoning, although this case involved a claimant’s appeal, employers also should have the right to appeal orders on return to pre-injury status. Accordingly, if the Commission denies an employer’s motion to terminate compensation and benefits pursuant to R.C. 4123.54(G), the employer’s remedy is to file an appeal pursuant to R.C. 4123.512.